RaCoin is created on a platform in the Bitcoin block chain. We present 10000 RaCoins to the first shop which introduced RaCoin in each country. The things that will be common in the future, we must not leave them for the future, we must do them now. You are a true proprietor end investor. RaCoin is the only real universal currency of Ramen that exists in the world. Why don’t we call it RamenCoin, but Racoin? That's because that is the name used in Japan, which is the major country of Ramen. In Japan, the words related to the Ramen are shortened to “Ra”. For example, if the word were RamenMania, in Japan it would be "RaMania". There are several words related to Ramen as that. 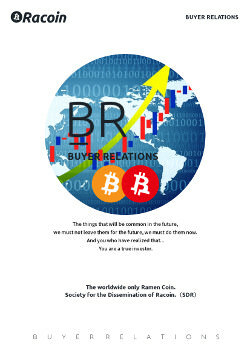 RaCoin was designed to be used worldwide by the Society for the Dissemination of Racoin (SDR). Initial Coins Offerrings (ICOs), or Initial Token Sales (ITSs) are mostly collective fundings that try to collect money. Therefore, the purchased currency has neither circulation nor compatibility. They are not designed for the actual use of the currency or the buyer’s benefit. On the other hand, most of ICO participants think as if it was the lottery and dream to obtain tremendous profits someday. Most are gamblers who buy with the thought of economic speculation. For that reason, there are many ICOs that take advantage of this demand. Therefore, it creates misunderstandings about virtual currencies or ICOs. However, instead of being an ICO, Racoin has been designed thinking about its usefulness and its popularization due to its exchange capacity. 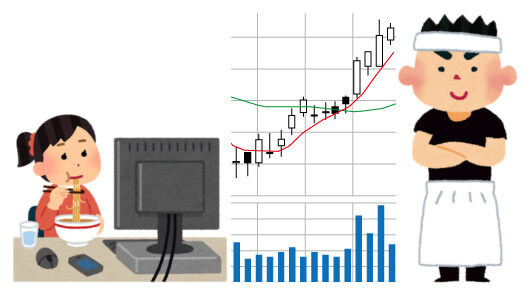 In addition, it can be used as a service ticket or as a tool to learn how interesting trading is. Racoin has the potential to be famous for being the currency of the noodle culture that continues to expand worldwide. SDR ensures that Racoin is the most realistic and the most reliable of the cryptocurrency that exist today. It may be that Racoin is the latest token economy for you to get the chance and make your dreams come true. There are several types of noodles in the world. Among all of them, like instant Ramen, Ramen is accepted by many places around the world. The number of restaurants that offer Ramen continues to increase. Could it be that there are still people who have never tried Ramen in the world? We must not forget that Ramen is not a meal only supported by the minority of rich people or ramen crazies, but the common population also loves it. Ramen is a mysterious dish that continues to evolve according to the culture or the customs of the country in which it is eaten. Racoin will revolutionize the noodle industry and will take it to a new phase. 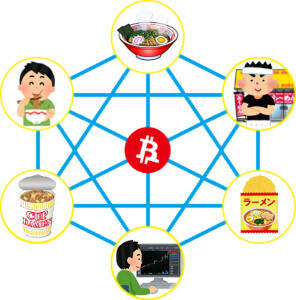 In addition, it will create a new world economic order, and will contribute to the vitality and dreams of the Ramen market. It has the responsibility of promoting globalization and expanding throughout the world as a dish of current interest. You will know the charm of Ramen when you get the Racoin. In addition, it will evolve with you when creating a new Ramen that can only be enjoyed in your country, and it is very sure that many people will love it. RaCoin is created on a platform in the Bitcoin block chain. 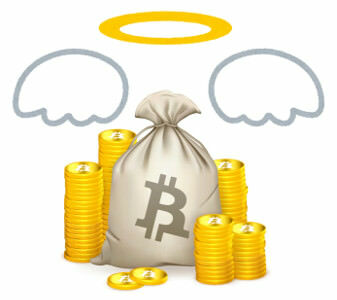 It is possible to use the well-known Bitcoin 2.0 service. RaCoin is friendly because it can be used in the same way as Bitcoin. 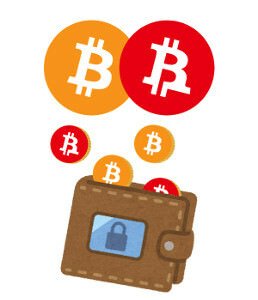 It can be saved in the same wallet as Bitcoin because it has exchange capacity. There is no need for your wallet to have torn service tickets or to be filled with service tickets from various stores. For example, a Ramen restaurant gives a RaCoin to a customer, to use it as a “Free Ramen ingredients ticket”. The RaCoin is changed to Ramen ingredients and returns to the restaurant's wallet. 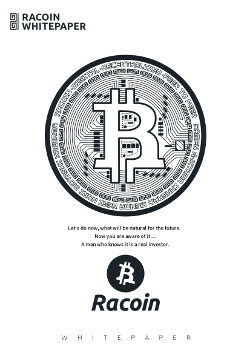 You can redistribute that RaCoin that has returned. In this way an average price of the ingredients is created, even using the ingredient service ticket. It may become a reality to be able to eat a Ramen dish with a RaCoin. It can also be used for instant ramen, mail orders, donations, campaigns, events, etc. and it will indeed be a revolutionary currency. Mining can be done by restaurants that serve Ramen, noodle dishes and also by the companies that use Racoin. For example, you can promote through social networks or in your restaurant that you have the service of a "Large Portion of Ramen for a Racoin today". The customer who has Racoins goes to the restaurant and can eat a large portion of Ramen in exchange for sending the Racoin to the restaurant's wallet. Like this example, the restaurants that use racoin, notifying their services and their events, can undermine the racoin with their ideas and send them freely. You can sell in the market or give your customers the mined racoins. That racoin gift will be a mine for the customer and it will be a pleasant discovery to find that restaurant. Mining Racoins will be linked to improve the restaurant’s service and offer a service that will not get your customers bored and can get the freshness of finding new services. The clients that expect Racoins will be happy with the variety of the restaurant’s services and will always be attentive. The risks of administration will be covered by the Racoin store, Angel. It is possible to distribute racoins of the number of people that exceed the equilibrium point of the restaurant. It is possible to be stable by controlling the number of customers and sales. Racoin will offer you something fun and it will be more rewarding to work for Ramen restaurant owners. It is difficult to remain motivated having a heavy work of many hours, with many things to do and with so few days of rest. Mining and trading Racoins will bring a new perspective to the life cycle that often becomes old routines. It will prevent the decline of your mentality and performance. It will expand your vision and values as an administrator. Discovering the market’s charm will give you something fresh and will give you vitality to your daily work. If your potential increases, that will improve the taste of your dishes. In addition, customers who have Racoins will be aware of the service that their restaurant offers, since it reflects the trends and changes of the market. Application form for Airdrop is now available on our official site. 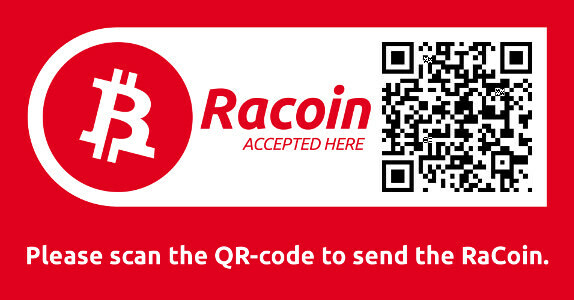 RaCoin can be exchanged via QR code and it gives you a pleasure of creating your own use of it. Regardless of other stores' behavior, you can fully enjoy utilizing RaCoin by yourself at your restaurant. If you are considering to use RaCoin for attracting customers or events, or if you wish to amuse yourself as well as your customers by RaCoin, apply for Airdrop on this opportunity. Up to 100 RaCoin per store. Total number of RaCoin to chain stores will be proportionate to the number of stores. No cost to receive RaCoin. We present 10000 RaCoins（equivalent to 1000000 yen）to the first store which introduced RaCoin in each country. Also, we will present 2500 RaCoins（equivalent to 250000 yen）to the introducer of RaCoin introduced store. 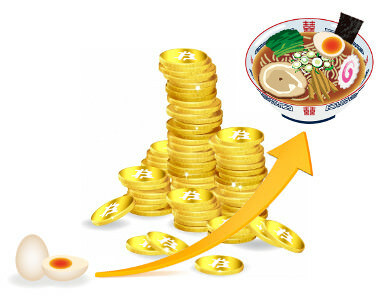 Not only ramen specialty stores, but also restaurants and companies that offer noodles can introduce this coin. RaCoin will be an effective customer collecting tool. Q2 - Q3: Promote to the stores of use. Q4: RaCoin's real dealings among foreign countries and Japan will be conducted at the Tokyo Olympic Games in 2020. We have many other secret plans that we have not named in the road map. It is very sure that it will entertain you and the market. Latest information from the SDR will be published at the BR (Buyer Ralations). *A Ramen restaurant in German has decided to use RaCoin. *A Ramen restaurant in Chiba, Japan has decided to use RaCoin. *White papers are written in various languages using photos of noodles. If you want to purchase RaCoin before listing, you can buy it at DEX at low price. Among many gambling cryptocurrencys, the investment in RaCoin will become very robust. A person who invests in a firm way not speculating is a professional investor. *Due to the leakage of this project, the SDR expresses our regret over the joke token that uses the name of the first RamenCoin by plagiarizing the RaCoin project. 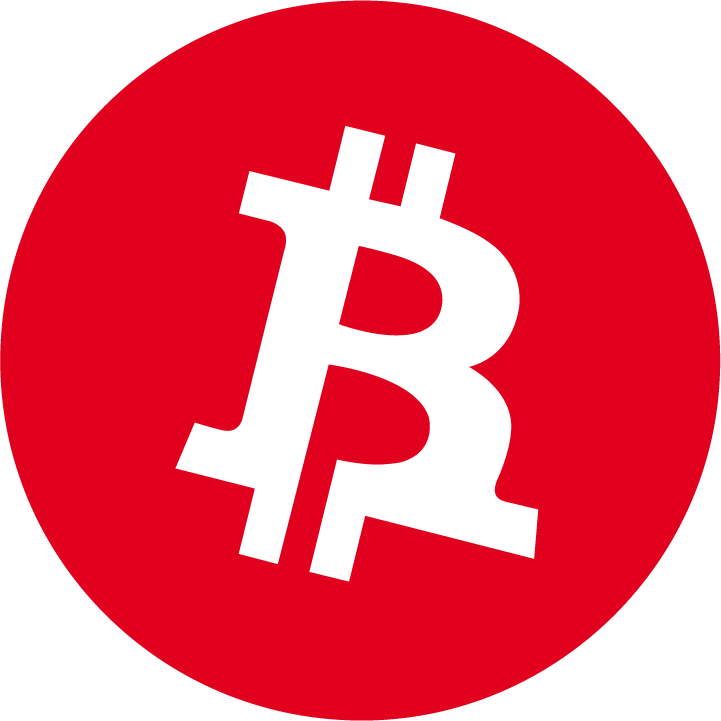 RaCoin is a genuine real RamenCoin. Be careful of similar fake coins. It has already been proved that RaCoin is a real ramen coin that is practical and valuable because some stores which already introduced RaCoin exist.